Come Mango season and you normally see us planning for Mango this and Mango that! 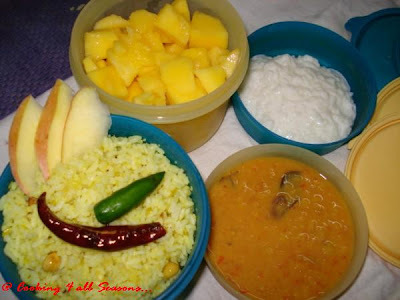 We for sure have Mango Dal or Mamidikaya pappu, Mango Chutney, Mamidikaya Perugu. I used to also prepare Mango Ice cream, Lassi, Milkshake. It will be Mango over dose. But you won't find any of us complaining on this over dose! Amma makes a yummy Mango Chutney, which I am yet to prepare this season. But we have had our share of Mango Dal and Mango Perugu. The latter is my most favorite form of eating Mangoes. Better than eating it as such, when combined with Curds, it takes you to a different level. Mamidikaya Annam is another form, which makes you enjoy the raw, tangy mangoes in its best form. We use the Kilimuku Manga as we call in Tamil. We call it pachi mamidikaya. 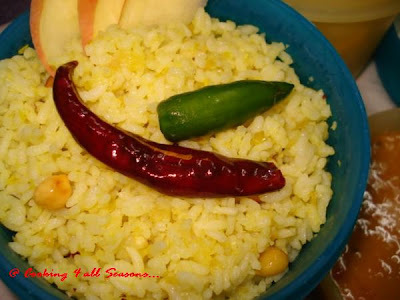 Both Amma and Athamma make this rice variety in different ways. I love both the versions. 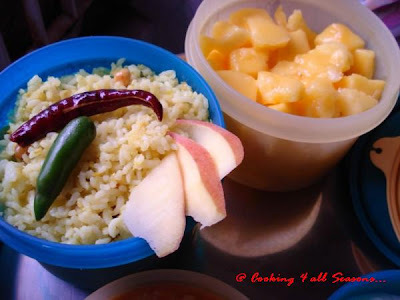 We made the way Athamma makes for our lunch box along with Mamidikaya perugu, our lunch box was one box of teasing stuff of heaven! Cool the cooked rice over a bowl. Grind the grated mangoes, coconut and green chilies to a smooth paste. Heat a kadai with Oil. Add all the seasoning ingredients one by one. Fry for 1 min. Then add the mango chili paste. Cook for 5 mins in sim, till it gets well cooked. Then add the cooked rice and mix well. My bowl of Mango Rice with Ripe Mangoes go to this month's special edition of Click hosted by Jungalbandis in Support for Bri of Figs with Bri. This month theme is Yellow!